33'' (about 7mm) Metallic Round Bead Necklace (Metallic Purple). Priced by the individual piece but please order in increments of 1 dozen. Most of the prices on our items reflect your cost per piece. Some items are packed and sold in incremental quantities such as dozen, gross, pack, units etc. Unless otherwise indicated in the item description, your cost will be the per piece price x the increment indicated. Please order in those increments when indicated. IMPORTANT: Please Note, the shades of the product color may vary slightly since we might need to use different dye lots on orders of large quantities. 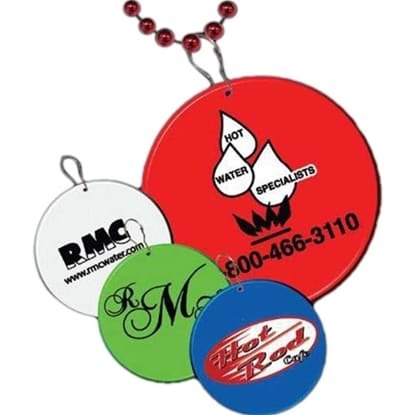 Our 2 1/2" clip on medallion badge is designed for quick and easy attachment to Mardi Gras beads. Choking hazard, not for children under 3 years old. Custom school spirit beads with 4-color process printed sticker. 33" necklace, 7.5 mm beads, 2 1/2" round medallion. Priced per each. Minimum order 150 pieces. Minimum order 24 pieces per school. (Combine schools to meet quantity discounts.) Give us the school name, mascot and colors. We do the rest! Please specify color code when ordering.